Proton therapy is a type of particle treatment that uses a beam of protons to treat cancer, most frequently localized, isolated tumors. Compared to standard radiation treatment, proton therapy delivers a high dosage of radiation that is very focused on the diseased tissue. Not only does this method necessitate fewer treatments, but also produces fewer side effects and leads to less damage to healthy surrounding tissues. East Coast Metrology (ECM) recently undertook the challenge of aligning a proton therapy system for McLaren Proton Therapy Center in Flint, Michigan. Proton therapy is a type of particle treatment that uses a beam of protons to treat cancer, most frequently localized, isolated tumors. Compared to standard radiation treatment, proton therapy delivers a high dosage of radiation that is very focused on the diseased tissue. Not only does this method necessitate fewer treatments, but also produces fewer side effects and leads to less damage to healthy surrounding tissues. East Coast Metrology (ECM) recently undertook the challenge of aligning a proton therapy system for McLaren Proton Therapy Center in Flint, Michigan. The facility is comprised of a synchrotron, switchyard, three patient rooms, and gantries that revolve around the patient positioning system within the patient rooms. 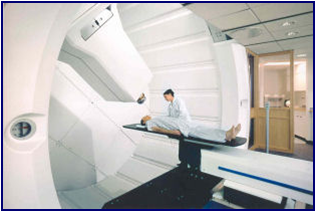 How does proton therapy work? 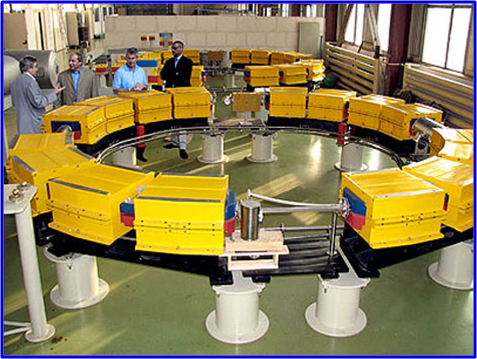 The protons travel around the synchrotron’s ring, which increases their energy to between 70 and 250 million electron volts (a voltage high enough to place protons at any depth within the patient’s body). From there, the protons exit the synchrotron and travel down the switchyard where they are guided to one of the treatment rooms. The 45 ton gantry that revolves around the patient positioning system directs the beam precisely to the appropriate place on the patient’s body. With an accuracy requirement of 0.1 mm (2 sigma) to design, install, and measure the control network, synchrotron, switchyard, gantry, and patient positioning system; ECM performed measurements using over 50 laser tracker positions, several total station set-ups, and multiple digital level survey loops. The project also required connecting measurements through three narrow passages and the use of over 50 control points on the floor and walls to tie everything together. Using SpatialAnalyzer® (SA), measurements were performed after completion of initial building construction, 90 days later just prior to systems installation, and after the many tons of radiation shielding had been installed. Other challenges facing ECM included increasingly restricted visibility to alignment features and the fact that the new building was settling (particularly after the shielding weight was installed). • graphically display measurements, points, instruments, sight lines, and uncertainty clouds. In order for proton therapy centers to deliver effective treatment that leads to better patient outcomes, their proton therapy equipment must be accurately installed. What is the key to accurate installation? High accuracy metrology.